The 2 Oaks Pub is positioned to overlook the 18th green and serves golfers a variety of ice cold craft beers, fun traditional cocktails and a fresh, tasty homestyle menu. Throughout your day at Twin Oaks Golf Course, you can count on experiencing the professional, friendly service that is a hallmark of JC Golf. Tournaments at Twin Oaks Golf Course are incredibly popular as the course features signature service combined with excellent course conditions and pricing that provides one of the most competitive values in the Southern California golf market. If you are looking for a beautiful banquet facility to host your next tournament or catered event, you can schedule a complimentary site tour at Twin Oaks. Twin Oaks is also an ideal choice for a romantic golf course wedding. The banquet facility at Twin Oaks can host up to 150 guests indoors with their own separate pre-function space. With the adjoining outdoor fireplace and patio there is no better place to create memories for a lifetime. Future brides will fall in love with long, sun splashed wedding lawn. The bridal party has their own room to prepare for the big day – making Twin Oaks an ideal choice for your southern California wedding. For water conservation, on-site weather station measures daily ET (evapotranspiration) and high tech moisture meters on greens provide exact green watering needs. Greens: 100% potable water; Fairways and Tees: 100% well water. 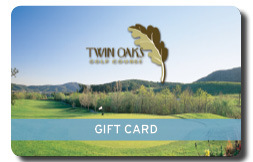 Complementing Twin Oaks Golf Course is the Clubhouse and 2Oaks Pub. The 2Oaks Pub, adjoined with the Pro Shop, hosts a full bar and delicious menu items. The clubhouse is an ideal venue for golf course weddings, banquets, and other special events. Contact the pro shop (760) 591-4700 for more information. 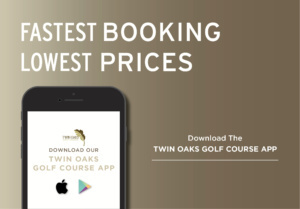 Twin Oaks is the perfect choice for hosting a golf tournament, with its signature service combined with excellent course conditions and pricing that provides one of the most competitive values in the Southern California golf market. In addition to great golf, Twin Oaks offers a beautiful banquet facility and several dining options for your tournament guests. Contact our Tournament Sales Director for more information on how to host your next tournament or outing. Join us for some fun and learn a sport you can play at any age. Come on your own or bring your friends and learn together. 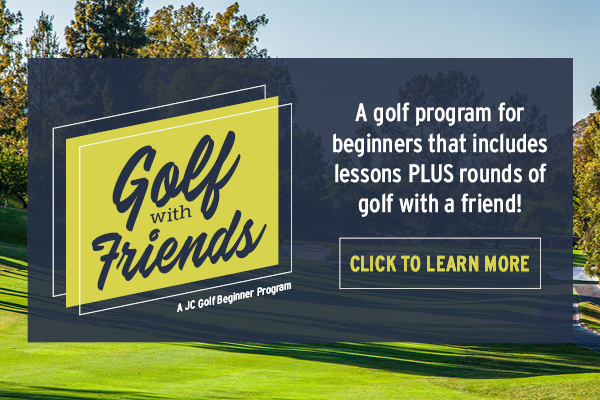 Register for the Golf With Friends Lessons Package today. Register for the Intro2Golf Lessons Package today. Personalized Golf Lessons are also available from our PGA Golf Instructors. For more information, call the pro shop: (760) 591-4700. The Twin Oaks Men’s Golf Club provides multiple formats and playing opportunities. We play Wednesday mornings, monthly Saturday tournaments, SCGA Team Play ( Match Play vs. other Clubs ), and Senior League for those 55+ in age. Join in on the fun and competition. For more information, contact Mitch Anderson at mander8628@cox.net. Please come join the Twin Oaks Women’s Golf Club where we combine a friendly, competitive atmosphere with the “true spirit” of the game. 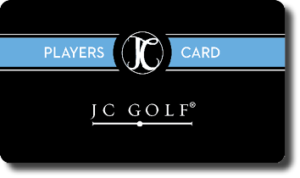 Tee times begin at 8:00 am on Thursdays and green fees are $39.00 with JC Card. For more information please contact us at jointowgc@gmail.com. For specials, check our Specials & Events page! For club rentals and pricing, contact the pro shop at (760) 591-4700. The 18-hole championship course at Twin Oaks is a demanding, but fair test for golfers of all levels. The unique course includes three signature water features and plays adjacent to a protected wildlife habitat, adding to an experience that is both challenging and picturesque. Elevation changes combine with quick, undulating greens to create an exciting course of both open and target-oriented holes. The Garden Room, a private, 2,600-square-foot banquet venue overlooking the course, and 2 Oaks Pub offer a variety of food and beverage options for pre-event and post-event functions.